Measuring and testing devices for use in the field, for quality assurance in mass production, for product development and for the new EnOcean certification. Test solutions for EnOcean technology are called PROBARE. The Latin name speaks for itself: the devices have been developed from practice for practice. Do you need an “EnOcean multimeter” for use in the field, for planning, installation, commissioning and documentation or for customer service? Our two PROBARE P10 and PROBARE P30 field test devices are your best and most reliable assistants. Do you need a professional EnOcean test transmitter and test receiver for development, quality assurance and mass production? Our EnOcean PROBARE P50 reference transceiver is the perfect fit for your requirements. Common to all devices are their long-term availability and firmware updates that are always free of charge. ViCOS provides training and engineering support. We will be happy to put together a package tailored to your specific requirements. The PROBARE P10 is the ideal choice for rapid testing of EnOcean transmitters. It indicates whether a device is transmitting EnOcean messages. Green, yellow and red LEDs on the P10 allow the receiving level to be categorized as “High” or “Low,” both of which are required for a reliable wireless connection, or as “No Installation,” i.e. not suitable for installation. The integrated filter function makes it possible to limit the level display to one EnOcean device. 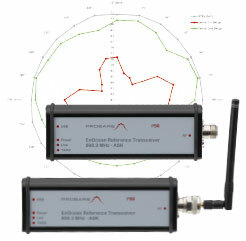 In addition to displaying the receiving level, the PROBARE P10 also operates as a level 1 repeater and as a remote terminal in a radio link test, which is the method standardized by the EnOcean Alliance for the qualitative assessment of bidirectional wireless routes. With its robust housing and handy dimensions, and powered by two AA/LR06 batteries, the PROBARE P10 belongs in the basic toolkit of any installer involved in EnOcean projects. The PROBARE P30 permits a far more detailed analysis of EnOcean wireless technology during the course of planning, installation and service. Its backlit graphical display shows the quality of wireless connections, the effect of repeaters and the contents of EnOcean messages in an attractive and easy-to-read format. The P30 operates as a repeater with a selectable level 1 or level 2 function and can be used in the radio link test as both a displaying test device or a remote terminal. The integrated monitoring and documentation of the EnOcean wireless channel are unique to the PROBARE P30. All EnOcean messages, including their subtelegrams, are stored, and other non-EnOcean users of the wireless channel are also documented, along with their level and transmission activity. The P30 stores all information on a USB stick, and the documentation storage period is limited only by the storage capacity. The collected data is evaluated with either Excel or the “DolphinView Advanced” developer tool from EnOcean GmbH. The PROBARE P30 is slightly larger than its little brother, the P10, but features the same robust housing and is powered by the same batteries.. It is ideal for planners or installers who work intensively with EnOcean projects or who want to document the EnOcean wireless channel over a period of days or weeks. Together, the PROBARE P30 and PROBARE P10 form the perfect duo for carrying out the radio link test, i.e. for testing EnOcean wireless routes in the planning stage, during installation or while performing service tasks. In developing an EnOcean device, the question always arises as to how well the integrated antenna works and whether EnOcean messages can still be correctly decoded at a low receiving level. The EnOcean Alliance has therefore defined requirements for the wireless properties of devices as part of its EnOcean certification process and published them in the form of a certification specification. The PROBARE PRO500 is the right test system for this purpose. It supports device development and naturally all measurements required by the EnOcean Alliance for device certification: antenna diagrams in transmit and receive mode, effective radiated power of a transmitter and limiting sensitivity of a receiver.